Anyways, I figured everyone was getting sick of my blush posts (don't even deny it), so today I've decided to move a few centimeters up the face...to talk about highlighters...L O L.
I JUST WANT LUMINOUS DEWY GORGEOUS SKIN OK.
Anyways, here's the stash that I now use for a non-vampirish glow! Starting with Wet n Wild's 'Reserve Your Cabana', this is the cheapest, softest, largest, subtle powder beige/champagne highlight you'll find at the drugstore. I usually deposit this along the cheekbones + top of cheeks (I LIKE GLOWY CHEEKS OK) and take it into the areas beside the nose to brighten my whole face up with a very very subtle glow that's perfect for daily use. The Balm's champagne highlighter, 'Mary-Lou Manizer'*, should be a staple in everyone's makeup stash, seriously. Tried and true, this highlighter is SO DARN SOFT AND PIGMENTED AND PERFECT DON'T QUESTION IT. Practically everyone got Benefit's 'Watt's Up' as Sephora's birthday gift last year, but you know what? This cream highlighter is actually amazing. This golden highlighter paired with a pink coral blush is perfection, though there is the tiniest hint of shimmer to this. There's a certain 'dewiness' that can only be achieved with a liquid highlight, and I love Benefit's 'Moon Beam' because it's a beautiful iridescent pink apricot highlighter. I find High Beam too stark for me (they say to wear High Beam for night parties BUT DO I LOOK LIKE I GO TO NIGHT PARTIES? ), but Moon Beam is perfect for daily wear and mesmerizing on the face as it catches the light. 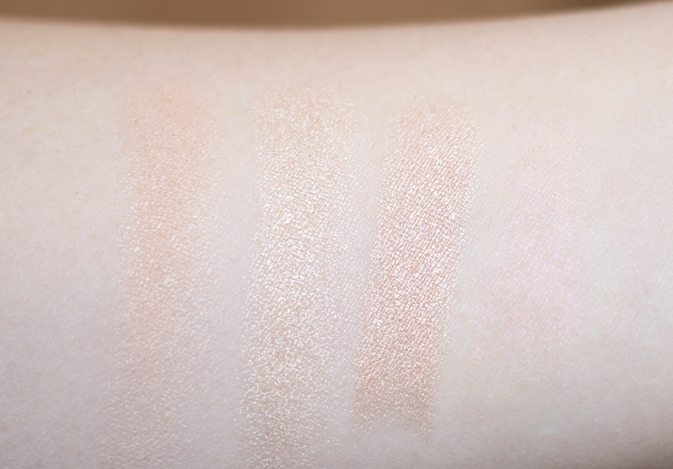 And of course, unblended swatches (except 'Moon Beam'). 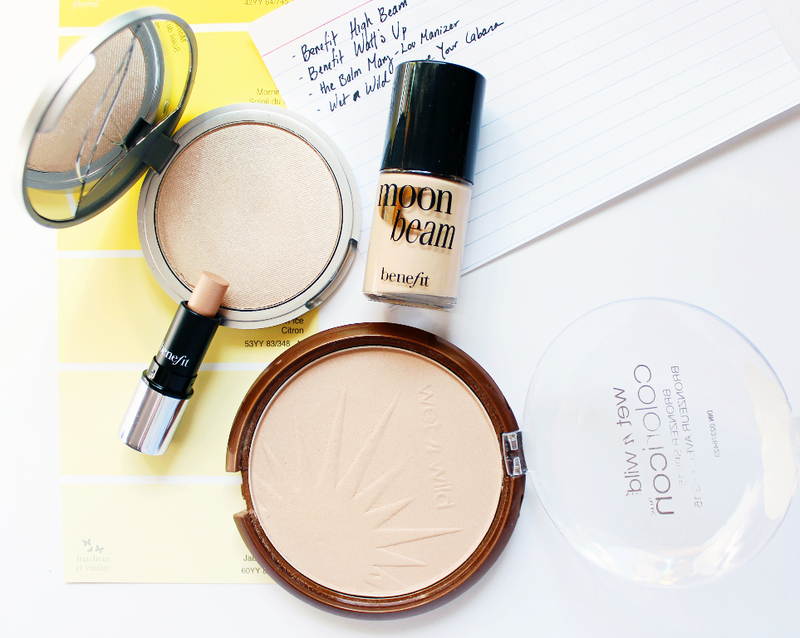 Do you guys use a highlighter on a daily basis? What is/are your favourite highlighter(s)? I seldom use highlighters, but I do love my Mary-Lou Manizer! I really wanted to like Benefit's Watts Up, but it goes on super patchy for me and picks up on any bit of dry skin. Good thing it was a birthday freebie. It's sad to say that i don't own any highlighters myself lol >_< My face is oily combo so I'm always scared that higlighter will make my face look even shinier than it already is, but I've always wanted to try the Benefit Watt's up! It's so cute, i love the packaging and it has the most pigmented swatch! I have a small what's up and I really like it! I used to think "oh that thing is strange, it's not worth it..." And Now I'm thinking about getting a full-size one. Haha loved your Suits reference! Louis might actually be my favorite character on that show :) They were filming once about 2 blocks away from my apt. but I didn't pay much mind cause that was before I started watching it. But I'm pretty sure they actually do most of their filming in Canada cause I'm always spotting what doesn't look like NYC. So this is your secret to those sharper than sharp cheek bones. I only started using highlighter recently and I'm kind of in love with my RMS Living Luminizer cause it's subtle but totally makes a difference. I love the Mary Lou-manizer and the Hourglass powder in Ethereal Light for highlighting. I definitely need to check out Wet n WIld and Benefit ones you mentioned. Best. Title. Ever. That is all. I have Mary Lou and Cindy Lou Manizer and Watt's Up. 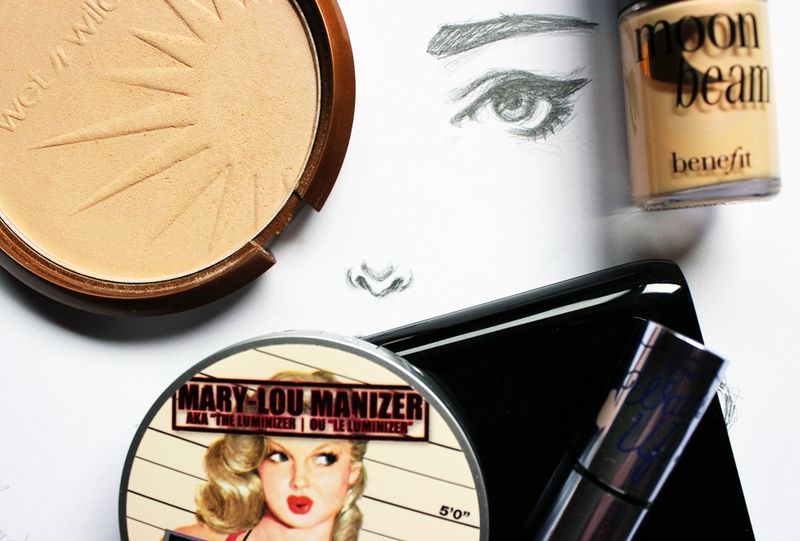 I use the Lou Manizers a looot more than Watt's Up - Mary is my go to eyeshadow and highlighter and I use Cindy with theBalm's Downboy all the time. :) I wish they still had Moonbeam! Highbeam is way to pink and light for my skin and Sunbeam is too dark haha. Moving up a few cm of your face is a wise choice! Hehehe... Not like we are sick of your blush posts, it's just that it would be lovely to see more of your beauty hauls. The Balm 'Mary-Lou Manizer' and Benefit 'Watt's Up' look pretty. I haven't used highlighter myself. It's just plain old BB cream. I haven't watched Suits and clicked on that Youtybe video. That looks funny. I think I should start watching tv again. Did you like just change your blog header or was I too slow to notice? It is so funny… I totally got the benefit highlighter for my birthday last year and it has just been sitting my makeup bag, now I am so excited to go and use it!! Who knew? it is like a little present for me today. HELLO SUITS WATCHER!!! I've been so busy I haven't watched this season yet omg, but my brother keeps trying to spoil me, I GOTTA CATCH UP ON EVERYTHING!!!!!! Harvey Specter woooot!! I LOVE Watt's Up, more so than High Beam! I always wanted to try Moon beam, but I've been scouting to see if benefit has those in the small packages in a box or something; there probably is but I keep overlooking it! Other than Watt's Up, I don't have many other highlighters, which is ridickss..need moar!!! !